The last in the series revisiting classic albums and old favourites. When Souad Massi’s second album Deb (Heartbroken) was released in 2003 it immediately became my favourite album of the new century and was played constantly in our house. Almost a decade later it’s never far from the CD player. Despite the subsequent release of three perfectly good albums this is the one which still sounds the freshest and remains the high watermark of her career up to now. Souad Massi was born in Algiers in 1972. As a teenager she flirted with flamenco before joining a political rock band called Atakor. Then in 1999 she left Algeria to travel to France and settled in Paris where she has remained ever since. She signed with Island Records and made her debut album Raoui in 2001. The first album was a sprawling mix of different styles and showed great promise but the release of her next album Deb was a huge leap forward. On Deb she sings in both Arabic and French and plays acoustic guitar backed by a large group of musicians with flamenco guitars, oud, violins, flutes, and various kinds of percussion including tabla and derbouka. The songs are all originals by Massi and they are concerned with themes of love and loss and with exile and memory. Despite the sombre note this may strike, these songs are also full of gorgeous melodies, uplifting singing and great musicianship. Massi does lively and exuberant just as well as she does wistful and sad. There’s a real mix of musical cultures and sounds too which sways from one style to another (sometimes within the same song) and manages to encompass bursts of flamenco, French and Algerian pop, string quartets, tango and waltz. The album as a whole has no real weaknesses and is totally irresistible. It’s hard to pin down highlights on Deb as everything is successful on its own terms but apart from the wonderfully indescribable title song there are two central tracks which are crucial. They are ‘Yemma’ (Mummy, I Lie to You) which opens with a typically yearning vocal and guitar from Massi then adds oud, percussion and violin, and the following track ‘Yawlidi’ (My Little Boy) which fades in with call and response vocals then drives along with a wonderful rhythm and melody which sounds almost like Congolese rumba. Her recent albums have been slightly more subdued and she hasn’t quite reached the sustained heights of Deb again. But the live concert album Acoustic, recorded in Alsace in 2007, is well worth seeking out especially in its DVD version. The 9th in the series revisiting classic albums and old favourites. Indonesian singer Detty Kurnia made the album Dari Sunda in 1991 and it soon became the all-time best-selling Asian album in Japan. The album was originally released here on Sony’s Wave label and was reissued by Riverboat Records a few years later as part of their ‘Women of the World’ series. It remains a classic album of the style known as Pop Sunda which is a mixture of Indonesian traditions and Western electronic technology. The album was produced by Makoto Kubota and co-produced by Lilik Aribowo and the recordings were made in Jakarta, Singapore and Japan. The Pop Sunda genre began in Western Java in the 1970s and the term came into general use in the 80s. The music of Sunda and other parts of Indonesia, along with outside influences, is combined on Dari Sunda and there is also a dash of Japanese and Okinawan music as Kurnia includes her own versions of the Japanese song ‘Sunayama’, and the Okinawan song ‘Hana’ by Shoukichi Kina. She sings both of these in Japanese. However, the outstanding performance on the album is Kurnia’s lovely version of what is probably Indonesia’s most popular song ‘Bengawan Solo’. Detty Kurnia was born in Bandung, Sunda in 1960, the daughter of a musician. She began singing from the age of six and made her first recordings on cassette when she was eleven. After moving into the Pop Sunda style she became the finest singer in that genre and on this album she spreads her wings further to sing an even wider range of songs. It’s this which makes it so accessible and takes it into another dimension. In the same year that Dari Sunda was released Kurnia was invited to perform at the first WOMAD festival in Japan. She recorded another album Coyor Panon not long afterwards in a slightly more traditional style and has made countless other recordings in her home country over the years. The eclectic nature of Dari Sunda means that the keyboards, guitar and samples of producer Makoto Kubota sit happily alongside the traditional rebab, kendang and gamelan. There is also a wide range of songwriters with each track having a different composer. It may not be very typical of the kind of music emanating from this vast country, which boasts so many styles, but there is nothing diluted or compromised about the music. Detty Kurnia sings beautifully throughout and has created a lasting Asian pop classic. Sadly, Detty Kurnia died prematurely in 2010 after contracting breast cancer. The 8th in the series revisiting classic albums and old favourites. Irish music went through a mini-boom in Japan during the 1990s with a large number of releases on CD mostly licensed from record companies in Ireland. As a reviewer I was sent several of these, and compilations with titles such as Celtic Countdown, Celtic Love, and Emerald Eyes started arriving from Victor Entertainment in Tokyo as well as albums by important artists such as folk band Altan and singer Mary Black. 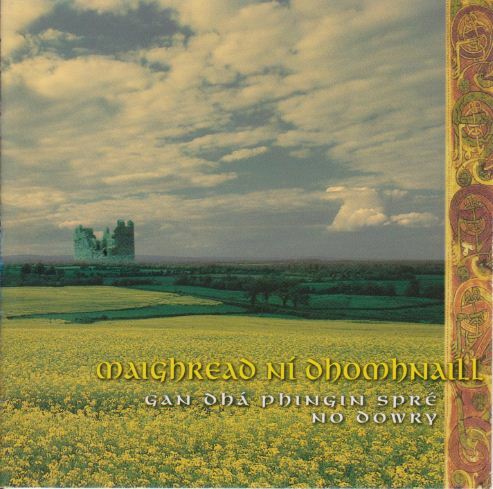 But nothing quite prepared me for Maighread Ni Dhomhnaill’s album Gan Dha Phingin Spre: No Dowry (to give it its full title) which to my ears seemed the best of the lot. It remains a superb collection of traditional songs sung by a wonderful singer. Maighread Ni Dhomnaill is from Dublin and grew up in a musical family where she developed into a strong and clear-voiced singer with a wide knowledge of traditional music. On No Dowry she is accompanied by her sister Triona and brother Micheal who also helped with some of the arrangements. Other musicians include Philip Begley, Donal Lunny and Liam O’Flynn. The whole project was produced by Donal Lunny and his name in the credits virtually ensures the results will be interesting at the very least. He is a master of the bouzouki and a fine keyboard and bodhran player. However, it’s as a producer that he has become well-known around the world over the past three decades. His ability to empathise with singers and to get the very best out of them has surely never been better displayed than here. There are ten songs on the album and six of them are sung in Irish, the other four in English. The CD booklet contains English and Japanese translations of the Irish language songs but it’s hardly necessary to consult them as the emotions generated by the singing and playing are enough to transfix the listener. This is most fully realised on two amazing performances ‘A Mhaithrin Dhileas’ (Dearest Mother) and ‘Is Fada Liom Iaim I’ (She’s Far Away, I Miss Her) but the entire album is a tour de force. The musicians just glide along beside the vocalist like a ship setting sail on the ocean. There is also one unaccompanied song in English ‘The Green Wood Laddie’. No Dowry was originally released in Ireland by Gael-Linn and later in Japan by Victor in 1997. Maighread Ni Dhomnaill came to Japan around this time to perform and I met her for the first time in Osaka. She came back again not long after that to sing some of the songs from her album as a guest vocalist in Donal Lunny’s regrettably short-lived big band project Coolfin. In 1999 she made another album Idir an Da Sholas (Between the Two Lights) with her sister Triona. The 7th in the series revisiting classic albums and old favourites. Koza Dabasa was the most ambitious of all the albums made by Okinawa’s Nenes. Recorded in Los Angeles in 1994 and released on Ki/oon Sony, the list of celebrated guest musicians included Ry Cooder and David Lindley (guitars), David Hidalgo (accordion), Bob Glaub (bass) and Jim Keltner (drums). Now this could have been a recipe for disaster with too many cooks spoiling the broth but happily it turned out to be a great success. The album manages to show off the brilliance of both Nenes and Okinawan music in general without diluting or interfering with what is really good about it. Much of the credit must go to the arranger Kazuya Sahara who was responsible for the distinctive Nenes sound. 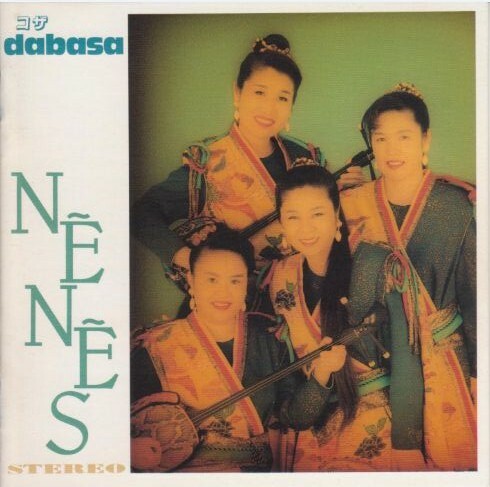 Many of the songs on this and other Nenes albums were written or co-written by the band’s mentor Sadao China who put the members together, chose what they were to sing, played sanshin and produced. The four women who sang on Koza Dabasa were Misako Koja, Yasuko Yoshida, Namiko Miyazato and Yukino Hiyane. This Nenes line-up made the band’s first six studio albums. All of them are superior to the albums made by subsequent line-ups. While Koza Dabasa is the most wide-ranging musically, both this and its predecessor Ashibi are equally successful. The second track on the album ‘America-dori’, is an exuberant song co-written by Bisekatsu and China. It celebrates the ‘champloo’ mix of people and cultures in Koza and contains an irresistible sanshin riff embedded in a rock arrangement. Other highlights on an album packed with them are ‘Katadayori’ which has solos from each of the four women; the traditional Okinawan ‘rap’ ‘Kurushima Kuduchi’; the popular and much requested ballad ‘Kogane no Hana’; and the exquisite last track ‘Shimajimakaisha’ a song about these beautiful islands which has Ry Cooder playing some of his inimitable slide guitar. It must have been around 1991, when their debut album Ikawu was released, that I first saw Nenes. Still relatively new to Okinawan music at that time, it’s no exaggeration to say I was gobsmacked by their amazing singing and by their entire performance at Osaka’s Banana Hall, which was seemingly packed to the rafters with exiled Okinawans clutching glasses of awamori and cans of the island’s Orion beer. A year or so later I met up with Koja and Yoshida for an interview when Nenes were back in Osaka for another concert to promote their second album Yunta. Listening to Koza Dabasa now it is slightly surprising how little sanshin there is to be heard on many of these songs but also how Okinawan in spirit it still sounds. The 6th in the series revisiting classic albums and old favourites. 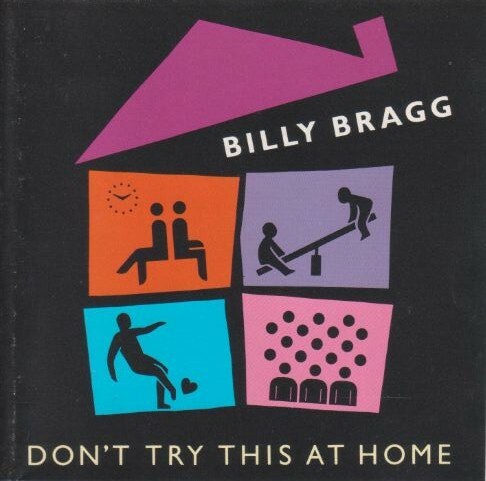 It’s hard to believe that more than two decades has passed since Billy Bragg’s album Don’t Try This At Home was released by Elektra. The 1991 album still sounds relatively fresh and it remains the finest blend of the personal and political that the English singer/songwriter has come up with to date. Words have always been a vital element of any Billy Bragg song but the 16 tracks on this album also contain lots of fine melodies and arrangements. His voice and guitar is complemented sometimes by a full rock band and at other times with a sympathetic sprinkling of different instruments including piano, mandolin, trumpet and flugelhorn. It all adds up to an album which is not just his most accessible but simply the best he’s made. Back in 1983, when Bragg’s first recordings were released, he came across as a left-wing political activist, influenced by The Clash, whose do-it-yourself attitude meant that he usually performed alone, accompanied only by an electric guitar. By the time Don’t Try This At Home arrived on the scene the commitment to causes and activism hadn’t softened at all but had broadened to include a number of other themes and developments in both singing and writing and the album has the best of both worlds. ‘Accident Waiting to Happen’ which starts off the album is a fine polemical song in the great Bragg tradition but this is immediately followed by ‘Moving the Goalposts’ a love song of real quality. The poignant ‘God’s Footballer’ refers to Wolves player Peter Knowles who gave up a successful career to become a Jehovah’s Witness. The most haunting song on the album though is ‘Tank Park Salute’ a tribute to the singer’s late father, while ‘Sexuality’ (co-written with Johnny Marr) is a catchy pop song with an instantly memorable chorus. Some of the words of the songs address racism, patriotism, and capitalism and ought to sound dated by now but are sadly still relevant in today’s world – for example ‘North Sea Bubble’ which contains the lines: “You keep buying these things but you don’t need them / But as long as you’re comfortable it feels like freedom”. I saw Billy Bragg live in London in the early 1980s and then again in Japan where I finally met up with him and his manager at Osaka’s Club Quattro after a concert not long after the release of this album. Since those days he has taken an increasing interest in folk and roots music and has also created some important new songs by setting original music to some lyrics left by American folk legend Woody Guthrie. His 2002 album England, Half English even shows an Okinawan music influence on one song, ‘Jane Allen’. But Don’t Try This At Home remains the high point for me… and I have long since forgiven Billy (a West Ham United fan) gently mocking me for wearing a Norwich City shirt during our brief encounter in Osaka. The fifth in the series revisiting classic albums and old favourites. 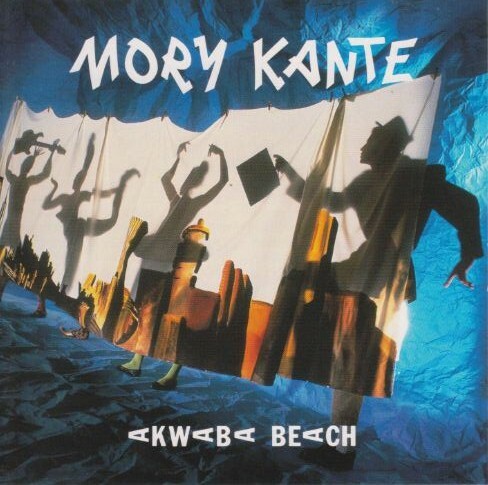 The singer and kora player Mory Kante from Guinea was the first African musician I listened to, through the discovery of his album Akwaba Beach 25 years ago. This led me to West African music in general and to musicians such as Salif Keita, Oumou Sangare, Youssou N’Dour, Cheikh Lo, Baaba Maal and others. Kante’s album Akwaba Beach was a major European success following the release of a hit single ‘Yeke Yeke’ – a love song from Guinea which in Kante’s hands typifies the Afro-beat dance style of the times. ‘Yeke Yeke’ was the first African single to sell over one million copies. An alternative version of the song opens the Akwaba Beach album which came out on the French Barclay label in 1987. In Japan it was released through Mercury and the album was even re-titled ‘Yeke Yeke’ to capitalise on the success of the single in Europe. Kante’s album has a big sound. The singer’s high, slightly nasal vocals are accompanied throughout by kora and by a band playing guitars, saxophones, trumpet, trombone, keyboards, bass, drums and djembe. There is also the distinctive call and response backing vocals reminiscent of some Okinawan music. But although this is full of keyboards and beats and high energy, the album also contains some softer, slower music with gorgeous melodies and it was this which initially drew me in and which still makes me want to listen to the album now. The title track ‘Akwaba Beach’ closes the album and it really is the most outstanding song. It begins with the luscious sounds of guitar and keyboards ushering in the vocal which perfectly evokes a mood of nostalgia and longing. It doesn’t matter that Kante is singing in a language that most listeners won’t understand. Whether it’s the relentless beats of ‘Deni’ and ‘Nanfoulen’ or the slightly more subdued ‘Inch’ Allah’ and ‘Africa 2000’ everything is just right and the eight songs contain not a moment of superfluous sound. Mory Kante comes from a griot family of hereditary musicians and grew up immersed in the kora (African harp) and in roots music. In his early days he was a member of the Rail Band of Mali and when Salif Keita left the band he took over as the main vocalist, eventually moving to Paris to begin his solo career. He has continued to make albums in a similar vein to Akwaba Beach but returned to Africa to make the very different acoustic album Sabou in 2004. He may not have been able to repeat the popular success of Akwaba Beach but the album remains a gem of rich melodies and rhythms which still sounds rather wonderful. The fourth in an occasional series revisiting classic albums and old favourites. 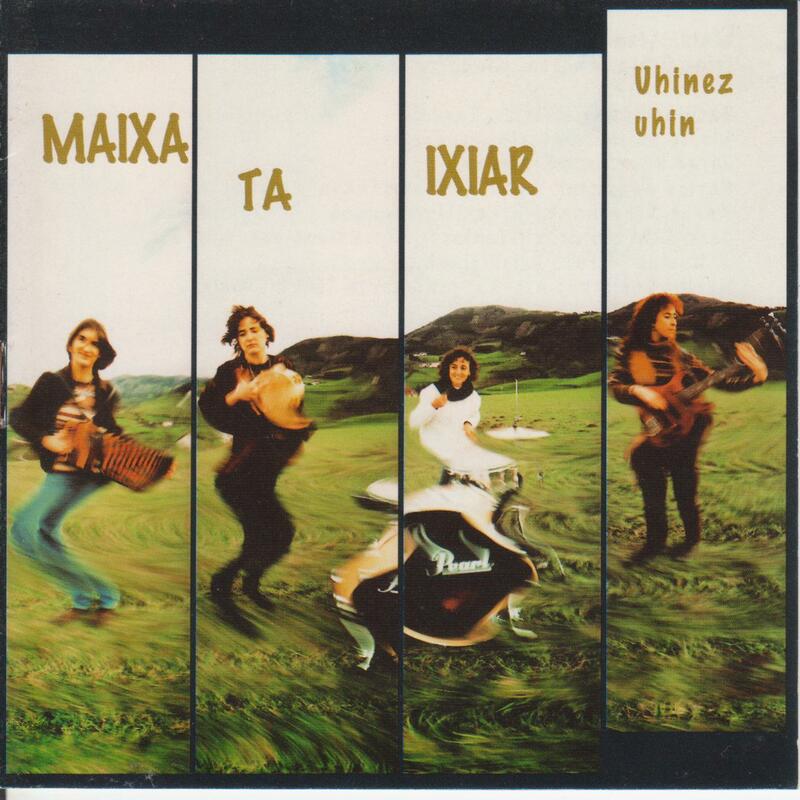 Uhinez uhin was the first music I listened to from Euskal Herria – the Basque Country. It managed to captivate me in much the same way that Okinawa and its music had a few years earlier. The album was the second recording by Maixa Lizarribar and Ixiar Oreja, two young women from the Gipuzkoa region of the Spanish Basque Country. They had begun as a trikitixa duo playing the traditional energetic melodeon/accordion and tambourine music of the area. Then in 1988 they got together with Garbine Sagastibeltza (bass) and Marie Helene (drums) to form the band which appears here playing music described variously as ‘roots-pop’, ‘ethno-punk’, and ‘triki-pop’. Uhinez uhin was made in 1995. Its first track is the glorious dance song ‘Espartzinarena’. On this and the rest of the album Maixa plays accordion and Ixiar plays tambourine with both women sharing vocals. The 14 tracks adhere loosely to the sound of trikitixa-led melodies played in a rock style: all with distinctive singing characterised by frequent whoops and yells – and, of course, sung in the Euskera language of the Basques. There are also hints of other musical elements such as reggae and funk which they were to develop on subsequent albums. Their next album Mantalgorri was released in 1997 and it opens with the excellent ‘Bexamela ta pastela’ – a playful love song written by Ixiar Oreja seemingly in praise of béchamel sauce and cake, while their next album Solasin, released the following year, contained the hit song ‘Mikele’. By that time the band’s line-up had changed and there were now five members including two men. After eleven years and more than a thousand live shows at concerts and festivals Maixa ta Ixiar called it a day at the very end of the last century, giving their final performance on 30th December 1999. Since then Maixa has made a solo album Sentitzen naiz with a small band of jazz musicians. Meanwhile Ixiar has been involved in work as a children’s television presenter. Other duos and bands such as Alaitz eta Maider and Imuntzo eta Beloki successfully popularised the lively triki-pop style too but it was Uhinez uhin which first led me to the music and it still sounds pretty good today.